Cat Friends! Now Starrring: Bas! I’d like to introduce a new series on the blog: Cat Friends! I’ll be profiling my own personal inside cat friends as well as our outside ‘maverick’ cat friends. Maybe I can profile your cat friends too? Leave a comment below with your email address or blog link if you’re interested in introducing your cat friends on Jenojoon! 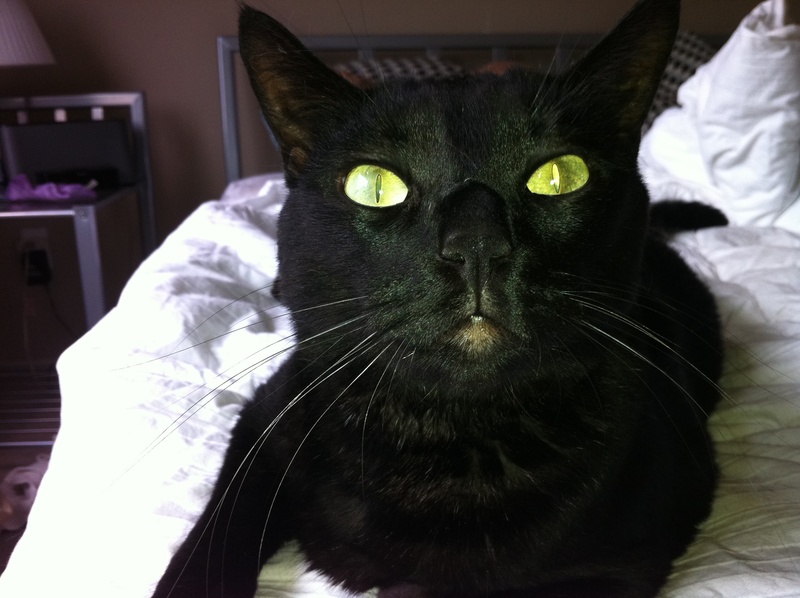 Our first featured cat friend is Bas (pronounced Boss)! Bas is my very first cat. I’ve had lots of roommates in the past that had cats and I always considered them my friends too, but Bas is the first cat I was able to adopt myself. Baby Bas on the day I brought him home! My husband is a huge cat lover (or Crazy Cat Lady as I affectionately call him). He had Mitzy Kitzy Hale as a cat friend growing up. But he wasn’t sure about us adopting a cat before Bas came into our lives. We lived in a rented house where we weren’t ‘really’ supposed to have animals. And he didn’t want to have a litter box in the house. I was sneaky though… and got my way. Someone (misguided) had dumped a litter of teenage kittens (teenage meaning they weren’t tiny babies, but still very kittenish) at my work. Luckily, I work with a whole bunch of animal lovers and all the kitties got adopted! Bas was the last one left. 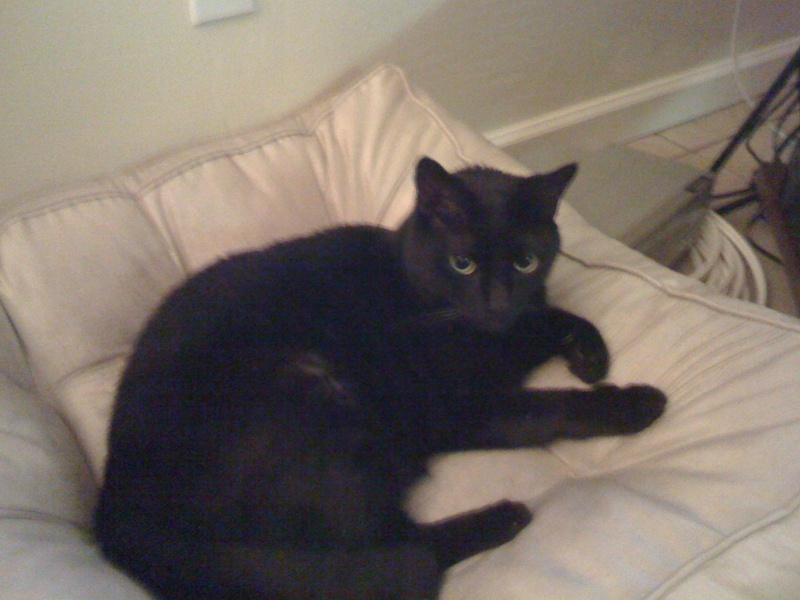 He was all black and super friendly (not sure how he wasn’t snatched up first!). Everything I’d always wanted in a cat friend! Bas when he was about 1- so regal! So to make a long story short(ish), I brought the little black kitty home and David decided his name was Bas (after Bas Ruten- MMA fighter and funny guy). Bas had to sleep in the kitchen the first two nights to make sure he was litter box trained and all that good stuff. Well, he was just a perfect angel! Went in the litter box, not too much scratching, loved to play with ribbons… I could go on. 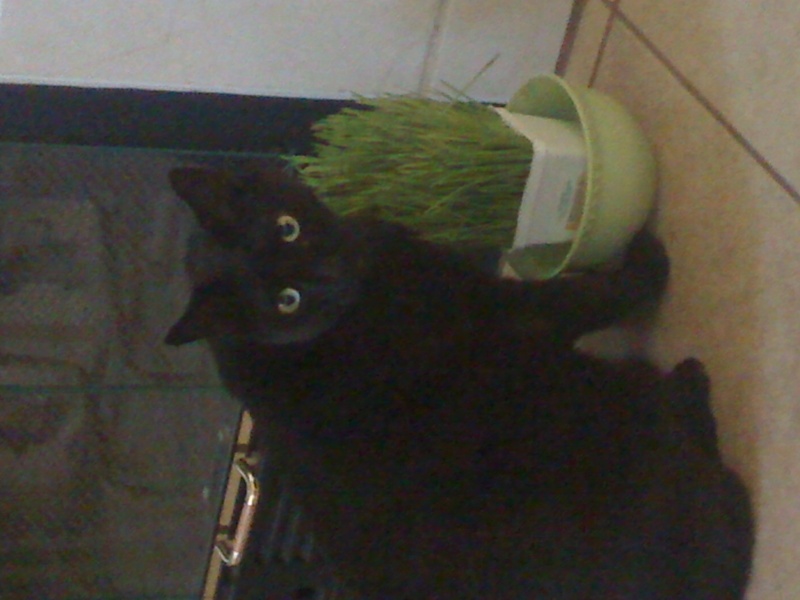 Bas LOVES his sweet greens! Bas sits on the bathroom counter with me every single morning while I get ready for work. He licks water from the dripping faucet and keeps me company. I love him so much it hurts! Bas has THE MOST amazing emerald eyes! Thanks! I’m excited about it too! Squeee! I love him! This is going to be a great series. And I’m not even a cat person! What fun! I consider all three of my kittehs supermodels! They will be eagerly awaiting your casting call!! i love bas! what a cute little baby. As renters, we can’t have pets but there is an amazing cat named Mai Tai (promise I am NOT making that up) that lives next door with her approximately 80-year-old cool owner. Mai Tai visits us frequently because of the many bird feeders I have in the yard. I have several cool pix of MT that I would love to share. She is beautiful!